Last week, I chronicled some of the abandoned franchises from Nintendo’s arcade era (you can also learn more about a particularly bizarre game from that list here). Today, I’m looking at the games from the Nintendo Entertainment System and Famicom that, for whatever reason, never saw much love from either fans or the Big N and whose characters and setting fell into obscurity. I’m pursuing this topic, in response to criticism of Nintendo at E3 for “playing it safe” and sticking to established franchises, rather than creating new IP or resurrecting forgotten characters and settings. If Nintendo wants to, they’ve got a pretty wide range of options for bringing out the dead! One of the very earliest home console titles from Nintendo, Mahjong was also a top seller on the Famicom. Rather than following the “Shanghai” rules most of us are familiar with, it resembles the Chinese tile game with rules similar to the European / American card game rummy. An entry in the Vs. Arcade series was produced, as well as a four-player sequel the following year; was this Nintendo’s very first four-player game? At any rate, given the wealth of mahjong-style offerings out there, I see no reason Nintendo would want to revisit the franchise. Another very early Famicom title based on an “IRL” game. The title translates to “five points in a row” and it would be familiar to players who enjoy board games like othello, go and connect five. Nintendo doesn’t own any trademarks or copyrights on the name, which would be equivalent to trying to trademark “checkers” for example, so there’s nothing to be gained here. It was re-released on Japan’s Wii Virtual Console in 2006, and you will likely recognize the sound effects from other early NES / Famicom games! 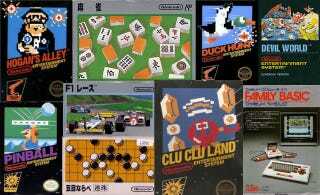 There’s little arguing Nintendo’s most creative, ambitious period was 1982 - 1987, the launch of the NES / Famicom era. Only then, and frankly never again, could a company like Nintendo attempt something as bold as a home computer programming kit, complete with peripheral keyboard, to use on an eight-bit video game console. Can you imagine Nintendo launching a “game” for learning Python or C++ on Wii U? Sort of a Pac-Man clone with religious iconography, Devil World is the only game designed by Shigeru Miyamoto to never see a North American release. Nintendo of America’s infamous puritanical policies regarding game content kept it away from these shores as it contains power-ups that resemble Christian crosses. (I don’t know whether Christians would be offended or mystified by a game in which a winged dragon pushes a cross, shoots fireballs and collects ice cream cones in an effort to defeat Satan.) Our European and Japanese friends can enjoy it today on Virtual Console; unlike, say, The Last Story, there hasn’t been an online movement to bring it to America, so I doubt we’ll ever play it here. This is a series with a brief but interesting history. The first title was a not-too-bad looking Pole Position clone; its later Game Boy port was an early four-player handheld game, provided everyone had a Game Pak, four Game Link cables and a four-player adapter (included with some SKUs). But rewind a bit and things take a strange turn with 1987’s Famicom Disk System-only Famicom Grand Prix: F1 Race and its 1988 successor Famicom Grand Prix II: 3D Hot Rally. The former features Mario on the cover, standing next to a Formula One-style open-wheel racer; but this is no proto-Mario Kart. Instead, we have a top-down racer similar to R.C. Pro-Am, and Mario’s only appearance is at the end of races in the winner’s circle (at least, I think that’s supposed to be Mario). 3D Hot Rally returns to the first title’s camera behind the car, with a stereoscopic 3D twist using the bizarre Famicom 3D System, an attempt to mimic Sega’s Master System 3D glasses kit. While it might not be a bad port for 3DS, I imagine Nintendo just wants to focus its racing efforts on Mario Kart and not deal with any lawsuits from the Formula 1 racing circuit retroactively protecting its trademarks. A not-too-bad early NES title which you can play on the Wii Virtual Console if you desire. This odd action / maze / puzzle hybrid’s greatest legacy is that some of its assets were used in creating The Legend of Zelda for NES. I think this one seems ripe for a new take, perhaps as an eShop title for 3DS. Fun fact: this fun but forgettable early NES title was produced and directed by none other than Satoru Iwata. Since it has a mini-game involving Mario rescuing Pauline, is this technically a Donkey Kong spin-off? Another early Light Gun Game Pak which I owned and loved. It lives on in a few WarioWare titles as a mini-game, and in the real world as an FBI training facility. That place got its name from an earlier shooting range, which in turn borrowed its name from a setting in the 19th Century comic strip “The Yellow Kid”. So, in a manner of speaking, this is Nintendo’s oldest IP! Will Nana and Popo live on in the forthcoming Super Smash Bros.? It’s hard to say, but you can still play this early Nintendo platformer on Virtual Console if you wish. Since the Japanese version featured clubbing baby seals, I doubt Nintendo has much interest in bringing the characters back otherwise. This list is getting pretty long, so I’ll cut it off here and be back next week with even more strange and amusing examples of Nintendo’s lost IP!